Is Smalling ready to cement his name in to Ferguson’s first team? With the potentially lengthy absence of regular first team members Rio Ferdinand and Rafael Da Silva, England under 21 star Chris Smalling may receive the chance to cement his name into Sir Alex’s first team, a position he’s craved and waited for so patiently and after a successful first season plus a fantastic under 21 European championship, a position he so richly deserves. After arriving from Fulham in the summer of 2010, somewhat under the radar, it’s fair to say the 21-year-old had his sceptics and after an edgy debut against Celtic he was quick to redeem himself after finding the net just two weeks later in a pre season friendly versus Chivas Guadalajara. Christopher’s first season was somewhat of a revelation after injuries to senior defender Rio Ferdinand meant Smalling was thrown in right at the deep end in pivotal moments of the race for league success. 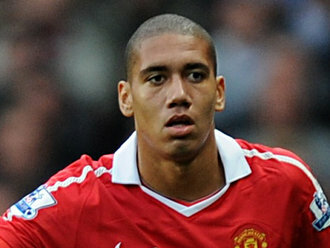 Smalling coped admirably with the pressure and his praises were sung by pundits and football fans all over the world. His jump from playing for non league Maidstone in 2008 to being arguably the best player on the field in one of the league’s most important matches in the 2-1 win over City at Old Trafford is quite phenomenal considering the youngsters relative inexperience. The sale of John O’Shea and Wes Brown is, in a way, testament to just how good Smalling’s first season was and the confidence the boss has in him and without that right back cover O’Shea brought Chris has been placed into a new and unfamiliar position in full back. Chris is of course a natural centre back but the qualities he possesses aren’t so typical of a centre back. Chris’ composure on the ball is reminiscent to that of Rio Ferdinand and his pace is something that most centre backs just don’t have. All these attributes along with his great strength and fantastic reading of the game of which we all know about made him a great candidate for the position of right back where he has shone brightly towards the end of last season, this year’s pre-season and United’s first competitive game of the year against West Brom the same game where Rio Ferdinand picked up his injury that could keep him out for up to two months. In years gone by a 6 week injury to Rio Ferdinand would have been disastrous news for all reds, now though the news has rarely been brought up and there is little to no panic from our fans. Ferdinand has been somewhat tainted with injuries over the past couple of seasons and “Rio out” has been a recurring headline in national newspapers, so much so that at this stage it doesn’t even warrant anger or shock from the United following. Though this time there is a difference, before it would have been safe to say a player of Rio’s calibre would walk straight back into the team, whether it was Wes Brown, Jonny Evans or John O’Shea covering for him, this time though may see his place in jeopardy. With the return of Patrice Evra expected on Monday night young Brazilian Fabio should be moved to right back in the absence of his brother Rafael, a position which Fabio shone in throughout the latter half of last season. These positional changes will hopefully and most likely mean a move to centre back for Chris Smalling and perhaps the final chance needed in his patient pursuit to take centre stage at Old Trafford as a first choice centre back. While the talent Rio possesses is still there for all to see, injuries have been his downfall. Rio’s injuries have gone hand in hand with Smalling’s rise in prominence much to the delight of Chris Smalling. While quality young centre backs at the club are in no short supply with talents like Jonny Evans and new acquisition Phil Jones knocking on the door but Smalling’s progress in the first team has been unparalleled, and the similarities between himself and Rio means that Chris will fit perfectly in beside Nemaja Vidic with no teething problems you might get with other centre backs, and while the chance he got last year may not have been enough considering his “rookie” status as a young new signing but now with a strong season under his belt could this be his opportunity to overtake Rio as the first choice centre back? I certainly think he has capable of filling Rio’s shoes, sooner rather than later.